Working out with wired headphones should be outlawed. There's a good reason why companies like Jaybird and Beats have been making wireless in-ear headphones for years now that are designed for people who train to the tune of their favorite music. And if you're one of those people, you might be interested in one of the more recent wireless headphones to come out - the Sport Pace. 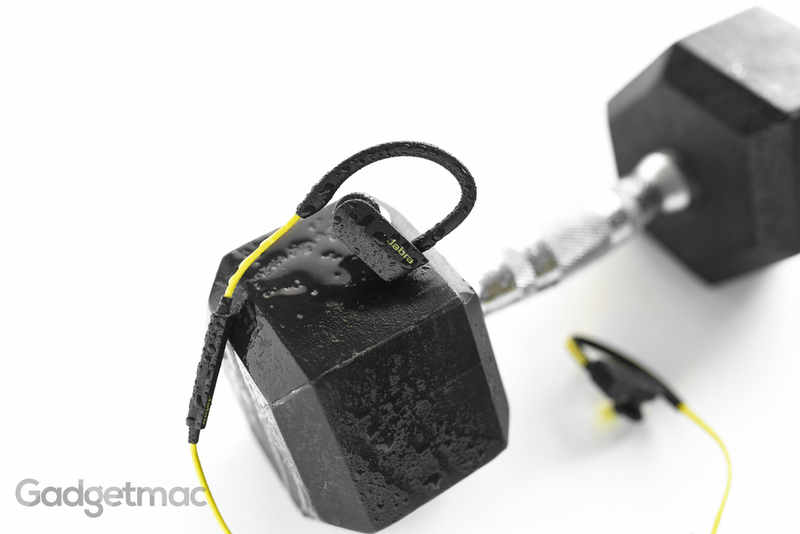 Although technically not in-ear headphones, the Sport Pace are one of Jabra's newest additions to its wireless sports earbuds collection built to withstand military standards for sweat, rain, dust, and shock resistance. These wireless sport headphones aren't just for music listening, they'll motivate you and enhance your workouts. Be sure to catch our full review after the break! Inside the box, you'll find very little included with the Sport Pace. A getting started guide, two additional silicone ear tip sizes and a micro-USB charging cable. While I will forgive Jabra for not including a protective storage case, I really think Jabra should have included a lot more tip options and even ones made out of foam since not everyone is going to be pleased with the limited selection of ear tips included with the Sport Pace. The Sport Pace are one of three sport wireless earbuds from Jabra, and are the least expensive at $100 as they don't feature any built-in motion and heart rate sensors like the $150 Sport Coach and $200 Sport Pulse wireless earbuds. Their ear hook design offers the most secure fit out of the three. The Sport Pace might have borrowed a little from the sleek looking PowerBeats 2 as far as styling, but we're not complaining. We actually love the ear hook design when it comes to workout headphones. The Sport Pace are specifically geared towards people looking for wireless headphones to use during intense workouts and fitness routines. They've got a secure around-the-ear fit and include Jabra's integrated training app with in-ear voice coach guidance to help set goals and track the progress of your workouts so you can stay focused and let your "virtual coach" keep you the zone in real time. Build quality is all right, nothing too fancy and as good as any other wireless pair of sporty earbuds currently out on the market for under $200. With an IP54 rating, the Sport Pace are made to withstand everyday abuse - as well as being sand, dust, water and sweat-resistant so can sweat wearing them and run in a down pour. 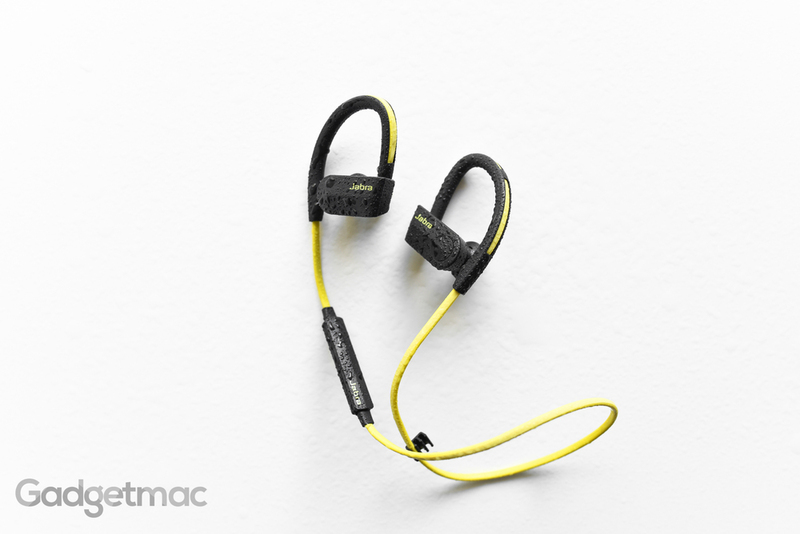 The really good thing about the all-plastic construction of the Jabra Sport Pace is that it makes them very lightweight, durable and very comfortable to wear during those strenuous activities both indoors and out. I especially like the short and somewhat flat tangle-free cable connecting the two earbuds together as it doesn't dangle too far below the neck. You can also shorten it to fit your preference. It doesn't drag around the neck when you move nor does it pull down on the earbuds, which is actually a problem with some wireless in-ear headphones. The cable also features a reflective coating that will light up at night when hit by headlights so that you can stay visible. While the fit of the Sport Pace is extremely secure and comfortable to wear for long durations, the seal is horrible. And that's due to the fact that these were not designed to fit straight into your ear canals like other wireless in-ears headphones such as the Jaybird X2 and JBL Everest 100. The silicone tips provided have not done a very good job in creating a good seal, which means that background noise will be an issue. But it's not all bad. You actually don't want total isolation when you're out exceeding with headphones as it can be dangerous when you're not able to be aware of your surroundings. And regardless of how much these earbuds isolate and create a good seal like other in-ear headphones, the Sport Pace still produce good sound. Granted, not as best as it could be with a better seal. It’s important to note that is you wear glasses or sunglasses with thicker than normal temples, they may even make that fit even worse due to the earbud hooks that wrap around the ears. Pro tip: If you want to improve background noise isolation and the audio overall in the process, you can now use Comply's T-160 foam tips made specifically for the Sport Pace. We've tested them and found them to improve the fit and seal inside the ears as well as the bass response considerably. With foam tips on, the Sport Pace outperform Jaybird's X2 and even the Earin thanks to a richer and fuller sound performance. The Sport Pace feature a "Sports" button on the left side of the earbud, which when used with the free Jarba Sport Life app, can be used to start a workout or pause one without having to pull out your smartphone. You can also at any time press this button to check up on your progress with real-time voice updates. Of course there's also a fully featured, rubberized in-line button remote and microphone that you can use to control your music, calls, check up on the battery, power the headset on or off, and use it to pair with your device over Bluetooth. Speaking of Bluetooth, the Sport Pace have a 10m (about 30ft) Bluetooth range, however, I found that beyond around 10ft, the Sport Pace will start to cut the audio with spotty interference that results in music skipping and sometimes entirely cutting out if you stand behind an object or cover the left side of the earbuds where the Bluetooth antenna is located. So if you need to leave your phone on the floor when you’re working out, you won’t have any issues with audio interference. Jabra claims up to 5 and a half hours of battery life, but I only ever managed around 4 and a half hours before having to recharge the Sport Pace. The good news is that with its rapid charge feature, 15 minutes of charging will provide you with an hour of usage. What sets these wireless sport headphones from all the rest are some cleverly implemented features. 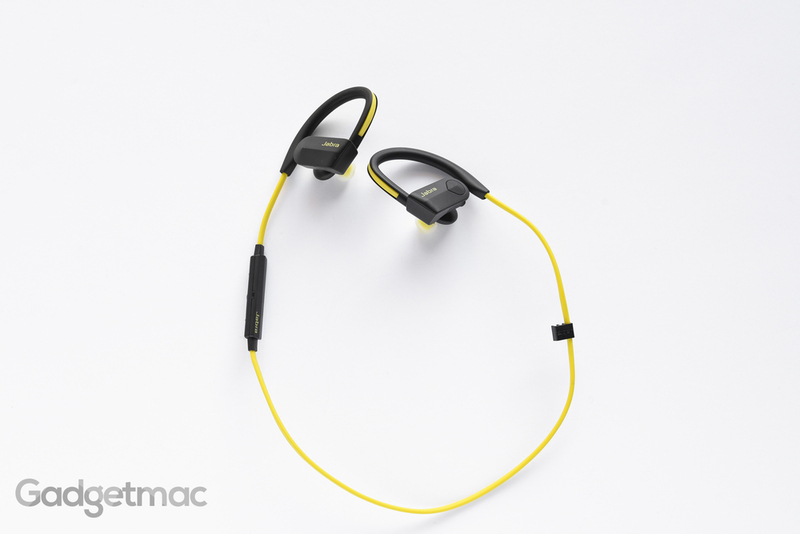 Boasting a stylish and lightweight ergonomic design, the Sport Pace have an impressively secure fit and will motivate you throughout your training with Jabra's comprehensive voice-integrated training app for iOS and Android, which will let you plan, track and evaluate your workout without having to use a smartwatch or a fitness tracker. In order to take full advantage of the Sport Pace, you will need to download the free Jabra Sport Life app for iOS and Android. It's entirely optional, but an enticing bonus if you aren't wearing any fitness tracking gadgets. So you may be wondering why would you need to use this app if you already have an Apple Watch or any other fitness tracker for that matter. Well, one of the benefits of using the Jabra app with the Sport Pace wireless earbuds is that the app will track your progress on a map using your phone’s GPS and sensors while also delivering your progress and other metrics like your pace and distance with audio cues inside your ears in real time. It actually makes you feel like you've got your very own Jarvis from Iron Man in a way. But not all features can be used with the regular Sport Pace model. To unlock other features in the app such as cadence and cross-training workouts you'll have to use one of Jabra's smarter Sport Coach or Sport Pulse models, which feature built-in sensors to measure your exercise. It will tell you your time, pace per mile, distance and how far you're into achieving your set goal according to your set preference of exactly when you'd like to be notified of your progress. It's a really motivating booster when you have an attractive-sounding realistic female's voice with a British accent in your ear telling you all of these updates during your workout. And when you've reached that goal, you'll be pleasantly surprised to hear encouraging words like "this was a top performance!". The app also lets you choose your music source, but it's best to leave it on the "current active" setting which simply means that any music being played will automatically be streamed over to the earbuds without interfering with the in-ear voice prompts of the Jabra Sport app. Audio quality is surprisingly good, very bright, very clear and clean. The midrange, however, is overly treble-rich and not as detailed. And while there’s some punchy bass present and enough to get you pumped during workouts when you crank up the volume, I can’t help but feel there isn’t enough of it. But that’s just me. I’m sure that the Sport Pace will easily impress most people who wear them with their clear sound signature and punchy bass that doesn’t distort and drown the mids and highs. If you want deeper bass, you’ll have to spring up an extra $100 for the PowerBeats 2 or grab the not-so-secure JBL Everest 100 wireless in-ears for the same price as the Sport Pace. While not as rich and full sounding as JBL’s Synchros Reflect BT, the Jabra Sport Pace are way more secure and actually stay in your ears. 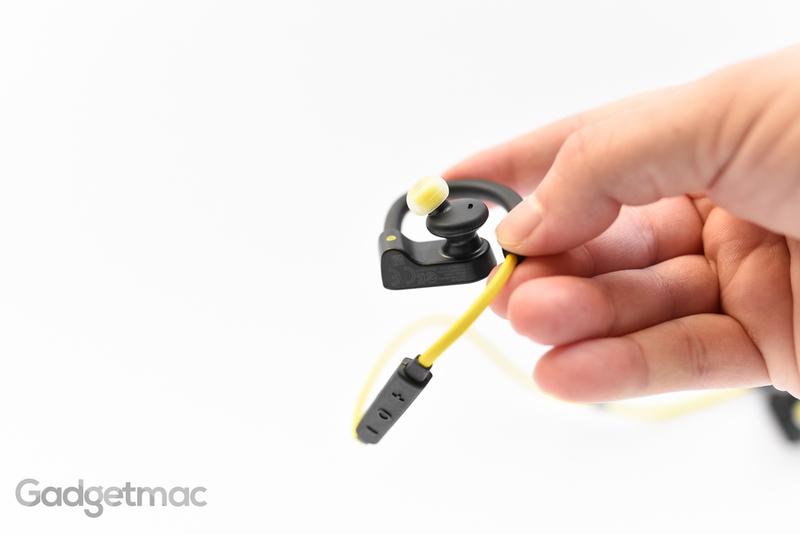 But what really stunned me the most was when I compared the Sport Pace against Jabra’s Rox wireless in-ears. The Sport Pace simply blow them out of the way in terms of fit and sound quality. They sound richer and more engaging, which is very impressive given that the Rox go further inside the ears than the Sport Pace and were designed to be used solely for music listening. It's not the most fair comparison I have to admit, but we noticed that the Beats PowerBeats 2 have come down in price recently from $200 down to around $150. And since the Sport Pace are strikingly similar, we thought we should pit the two against each other. First off, both have the same super secure fit and background isolation, and both sound very clean and clear across the frequency range. With that said, the PowerBeats 2 do sound more pleasing than the Sport Pace thanks to fuller sounding bass and more defined mids and lows that bring extra richness to everything. They make the Sport Pace sound like a radio with little fidelity when compared side by side. You would hardly notice how much detail isn’t present while listening to the Sport Pace unless you’ve just tried on a better pair of wireless earbuds…like the PowerBeats 2. After all, the PowerBeats 2 do have the upper hand with their dual drivers and of course the added cost of higher quality internals. So next time someone tells you that Beats are crap sounding and overpriced, just tell them they're only correct about the latter. As mentioned earlier, the Sport Pace with Comply foam tips installed sound a lot fuller and richer than the Jaybird X2, which are notably one of the best wireless in-ear headphones on the market. Jabra's Sport Pace are one of the most secure wireless earbuds we’ve ever tried, and the best sounding wireless earbuds we’ve tested from Jabra. 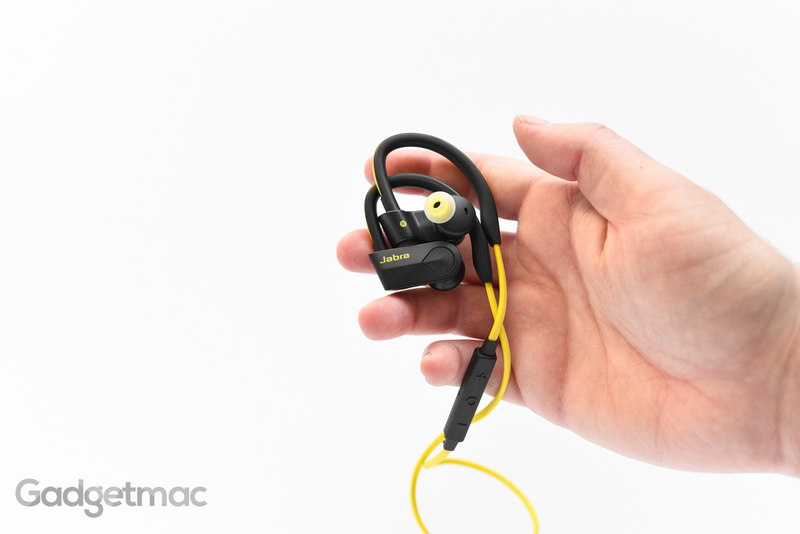 If you’ve ever had trouble keeping wireless in-ear headphones or earbuds inside your ears, you’ll love Jabra’s Sport Pace. And if you don’t want to spend $200 on higher quality wireless in-ear headphones like the Beats PowerBeats 2 and Jaybird X2, the Jabra Sport Pace are a great affordable alternative that gets the job done...albeit with a few caveats. The short Bluetooth range and spotty signal strength when your phone is kept in your pocket or in your bag - as well as the short battery life are really the only two caveats keeping us from highly recommending Jabra's Sport Pace. We really hope that Jabra does something about these two issues in the next iteration, because the Sport Pace are otherwise some fantastic wireless earbuds to have at a reasonable price. If you can spend an extra $50 or so and don’t mind the added voice guidance benefits of the Jabra Sport Pace, you can get the PowerBeats 2 on Amazon for around $150 – and we highly recommend that you do. Beats’ PowerBeats 2 not only have better battery life and Bluetooth reception, but they produce better sounding audio with deeper lows thanks to dual drivers and deeper in-ear tip fitting. But be aware that many users have complained about supposedly poor durability and build quality reliability. Update: It turns out that Bluetooth reception on the PowerBeats 2 is just as bad as the Sport Pace. We experienced audio interruption using the iPhone 6s when held and covered with the hand or put into a deep pocket when facing the opposite side of the left earbud, which houses the Bluetooth antenna. Putting your phone into your left pocket or holding it with your left hand seems to fix the issue on both the PowerBeats 2 and Sport Pace. Update 2: We just slapped a fresh set of Comply foam tips on the Sport Pace and we liked how they sound and fit after this little third party upgrade so much, as well as finding that they sounded more appealing than Jaybird's X2 and also the Earin – we decided to give them our Editors' Choice Award and general recommendation for being wireless workout headphones we like using personally.